Epilepsy is a group o neurological disorders chairacterised bi epileptic seizurs. 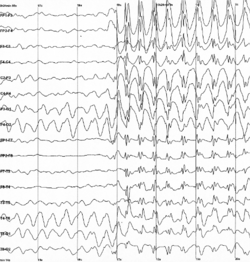 Epileptic seizurs are episodes that can vary frae brief an nearly undetectable tae lang periods o vigorous shakin. Thir episodes can result in pheesical injuries includin occasionally braken banes. In epilepsy, seizurs tend tae recur an as a rule, hae na immediate unnerlyin cause. Isolatit seizurs that are provoked bi a speceefic cause such as pushionin are nae deemed tae represent epilepsy. Fowk wi epilepsy in some auries o the warld experience stigma due tae the condeetion. ↑ 1.0 1.1 Chang BS, Lowenstein DH (2003). "Epilepsy". N. Engl. J. Med. 349 (13): 1257–66. doi:10.1056/NEJMra022308. PMID 14507951. ↑ 3.0 3.1 3.2 "Epilepsy Fact sheet". WHO. February 2016. Retrieved 4 March 2016. ↑ Fisher R, van Emde Boas W, Blume W, Elger C, Genton P, Lee P, Engel J (2005). "Epileptic seizures and epilepsy: definitions proposed by the International League Against Epilepsy (ILAE) and the International Bureau for Epilepsy (IBE)". Epilepsia. 46 (4): 470–2. doi:10.1111/j.0013-9580.2005.66104.x. PMID 15816939.